Young Men's Edition with Online Audio. Arranged by Louise Lerch. Vocal Collection. Musicals. Softcover Audio Online. 56 pages. 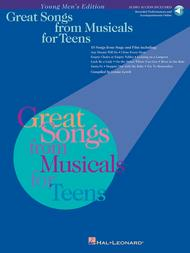 Published by Hal Leonard (HL.740165). ISBN 0634031473. 9x12 inches. Compiled by Louise Lerch with companion recordings of performances and accompaniments. Contents – Young Women's Edition: Diamonds Are a Girl's Best Friend (Gentlemen Prefer Blondes) • God Help the Outcasts (The Hunchback of Notre Dame) • Honey Bun (South Pacific) • I Enjoy Being a Girl (Flower Drum Song) • I Got the Sun in the Morning (Annie Get Your Gun) • I'll Know (Guys and Dolls) • Much More (The Fantasticks) • Reflection (Mulan) • Shy (Once Upon a Mattress) • Unexpected Song (Song and Dance). Contents – Young Men's Edition: Any Dream Will Do (Joseph and the Amazing Technicolor Dreamcoat) • Close Every Door (Joseph and the Amazing Technicolor Dreamcoat) • Empty Chairs at Empty Tables (Les Misérables) • Leaning on the Lamp Post (Me and My Girl) • Luck Be a Lady (Guys and Dolls) • On the Street Where You Live (My Fair Lady) • River in the Rain (Big River) • Santa Fe (Newsies) • Steppin' Out with My Baby (Blue Skies) • Try to Remember (The Fantasticks).